Carbon monoxide (CO) is an odourless, colourless gas that is infamous for being a ‘silent killer’. Carbon monoxide is produced during the process of burning gas and is therefore present in the flue gases emitted by ducted gas heaters, at varying levels. There are accordingly very strict regulations in regards to the installation of gas appliances and their flues. 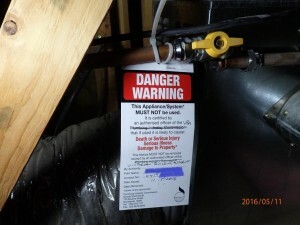 During the course of our works in investigating defective plumbing works across Victoria though, Metropolis Solutions has identified numerous instances where gas flues have been installed in a haphazard and negligent manner by licenced gasfitters. In one instance, we found that the gas flue pipe itself was completely missing from the ducted gas heater installation in a brand new house. The gas heater was turned on by the family and the flue gases were free flowing into the roof space of their family home which was directly connected to the living spaces via downlights and other service penetrations. Fortunately the licenced gasfitters had in this instance also forgotten to connect the condensate drain and so water poured into the ceiling. The collapse of the ceiling led to us being called to the site and identifying the extremely serious gas flue defect which was actually placing the lives of this family in very severe jeopardy – all completely unbeknown to them. There are many other instances that we have seen where gas flues have been installed contrary to regulation without appropriate sealing of the joints and with leakage of flue gases into the ceiling and cavities of domestic homes. We have also observed inappropriate use of cheap single-skin gas flues rather than double-skinned gas flues where required and we have seen gas flues being installed in direct contact with roof space timbers and duct work– all representing a concealed fire risk just waiting to burn down the house. Once our forensic plumbing specialists identify a serious gas appliance related defect, they are legally bound to isolate, disconnect, lock and tag the appliance or the gas supply and notify both the Victorian Building Authority and Energy Safe Victoria. This gives an indication as to how seriously these authorities take gas related safety concerns. It is very concerning that only a very small percentage of domestic plumbing installations are routinely audited by the VBA (approximately 3%) and that the plumbing industry is otherwise entirely self-regulated. Prosecutions of plumbers by the VBA are also very few and far between. Because of all this, unfortunately some plumbers think they can just get away with cheap, dangerous work and that they will never get caught. If you have or suspect any concerns whatsoever with the compliance of your gas ducted heater or other gas appliance installation, you should take appropriate action without delay. Metropolis Solutions is able to carry out a forensic plumbing inspection on your gas appliances. If installation defects are found we can if necessary also launch a claim against the responsible licenced gas fitter and/or their Insurer – this covers all necessary costs to both investigate and rectify the situation including claiming back any costs for temporary heating supply during winter months if the system needs to be immediately shut down. Refer to http://www.esv.vic.gov.au/Portals/0/about%20esv/files/stickers/ESV_4ppA5_CarbonMonoxideBrochure_WEB.pdf for more information on Carbon monoxide.